Home Lifestyle	We voted. And now we wait. I always get emotional on Voting Day. It’s a huge deal that we live in this extraordinary country. I treat it like a holiday of sorts. Don’t tell but we actually listened to Christmas music during breakfast! 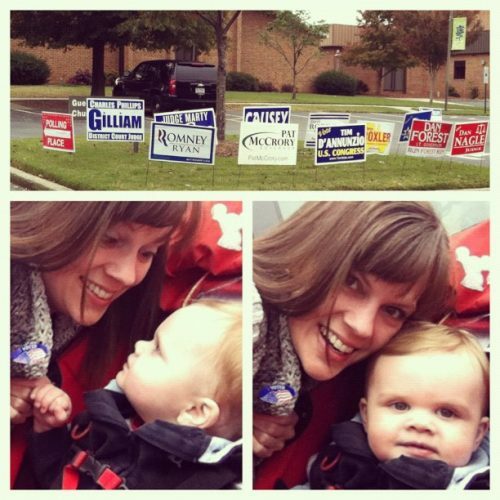 So after I took Oscar to school, Calvin and I went to our polling place and I voted. Me. Just me and my opinions. I picked up the pen and I filled out my ballot for the 10th time in my life. It’s an amazing privilege to be a part of this process and I consider it an honor. There has been a lot of mud-slinging this year. I blame the ease of Social Media and people forgetting that there are actual humans connected to their screens, but I know I am not alone in my election fatigue. But we aren’t all crazy. In fact, as we are finally nearing the finish line, I have been pleasantly surprised to find a number of really inspirational posts from both sides of the aisle. I will share them below and I hope you check them out! By voting, we have done our part. Respect the Process – by my friend Jo-Lynne Shane. It’s a beautiful post and a great reminder of who we should put our faith in. On Election Day, pause to marvel at democracy – Frida Ghitis on CNN – This is one of those 30k feet posts about the value of this great Republic. On being a Christian and voting as a Democrat – I typically disagree with Kristen when it comes to politics, but I respect her honesty and willingness to share the why behind her vote. This post is an important reminder that no Christian holds the direct line to God or His will for this election. 2012 election: It’s a bully-fest and it must end – Julie hits the nail on the head when she speaks of the bullying effect of this election. I think we will all heave a collective sigh of relief when it’s all over. Monday Morning – by Peggy Noonan ( a Reagan conservative and speech-writer) who has had a rocky relationship with the Romney campaign in the past. Man she knocked it out of the park with this opinion piece and her prediction of a Romney win. It’s always nice to read something encouraging about your own party (admit it, we all do it) but there is something about this piece that just oozes with experience. Maybe it’s the politics nerd in me, but it just reminded me of what an amazing and sad time this day must be for both men. thanks for including my post. It’s so rare I write something on the spot, but this really hit me today.